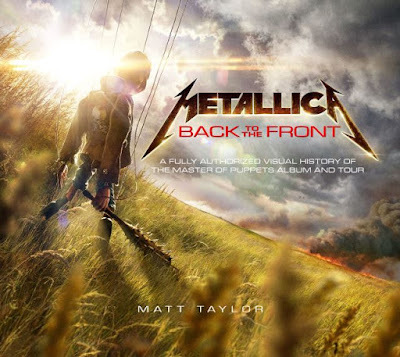 MetalRockNews: Metallica release cover of "Back To The Front" book about making of "Master Of Puppets"
Metallica release cover of "Back To The Front" book about making of "Master Of Puppets"
Metallica collaborated with author Matt Taylor for a book about the making of "Master Of Puppets". The band said: "We're pretty sure it will be worth the wait as the book is chock full of exclusive intensive interviews with all of us as we spent countless hours with Matt digging deep in our memory banks for stories, anecdotes, tidbits and tales from the studio, the road and beyond. Matt spoke to all the major players at that time in our history, including those who were with us during the making of the record, including producer Flemming Rasmussen and the man who mixed it, Michael Wagener. He tracked down the entire 'Master Of Puppets' road crew, including John Marshall and members of the bands who toured with us, Anthrax and Armored Saint. Our booking agent, tour promoters and managers Cliff Burnstein and Peter Mensch all were overly generous with their time and recollections. Faith No More guitarist Jim Martin and drummer Mike Bordin and Diamond Head's Brian Tatler spoke with Matt about their memories of those crazy times and, of course, you, the fans who were at those shows gave us an amazing view of your memories and experiences. Finally, we're honored that Cliff Burton's dad Ray sat down for an extensive interview. We all hit the storage lockers, attics and basements to fill the book with hundreds of never-before-seen images pulled from our personal archives and have been involved every step of the way to bring you the complete story. No stone was left unturned as we gear up to celebrate the 30th anniversary of the album's release." You can see the cover of "Metallica: Back To The Front" below. The book will be released in the fall of 2016.